The current app markets are pretty heavily saturated with retro games—from old school platformers to full-fledged role-playing games, there are enough interesting games to be play for the nostalgia indulged players. What is less frequent, however, are such great games that make you want to play the whole game without putting it away. More often than not these games are made with the same passion that we feel when actually playing them. Today I’m reviewing one of those lovely diamonds, namely Sword of Xolan by Alper Sarikaya. I might have already revealed too much but nonetheless let’s get dive into the review of this game. When booting up Sword of Xolan, I was amazed by a short sequence of cutscenes telling the gist of the story. Complete with dramatic music and narration, Sword of Xolan makes sure its first impression is epic but the cookie-cutter fantasy story doesn’t really have too much appeal on its own. 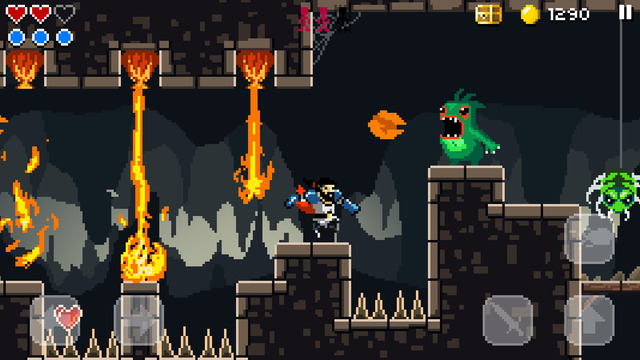 Sword of Xolan is a platformer after all—meaning a story is always welcome but absolutely not a neccesity. Moving on from the good versus evil, it doesn’t take long at all before I could get my hands dirty on some of the first levels of Sword of Xolan. 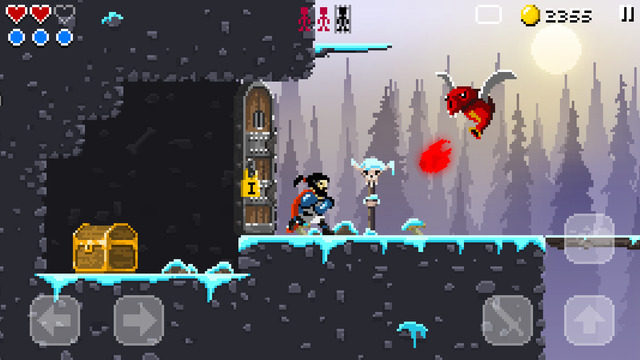 In Sword of Xolan you control your character by tapping buttons mapped out on your iPad screen—which is a more traditional approach to controls and the approach that I personally like the most. You will be moving around using the buttons pressed with your left thumb while your right thumb will perform actions such as jumping, striking with your sword or hurling fireballs at foes and objects. In each level there are secret passages to be found, containing prisoners that you can free or big chests with lots of money. This money can later be spend on special cards that give your character upgrades like extra mana and such. 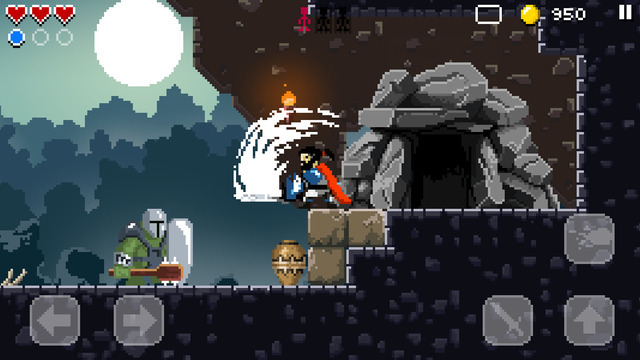 This unique mix of platforming with role-playing elements is not the only thing Sword of Xolan has going for it, however. The old-school graphics look very charming and do an amazing job on being dinstinctive throughout the three worlds in Sword of Xolan. Add up some amazing boss fights and awesome level design and you got yourself a fantastic game. The soundtrack isn’t traditionally old-shool—no authentic chiptune or 8-bit music but a more modern approach that still works wonders on the game. The songs are all mesmerizing and add up to the fantasy presented in the game. 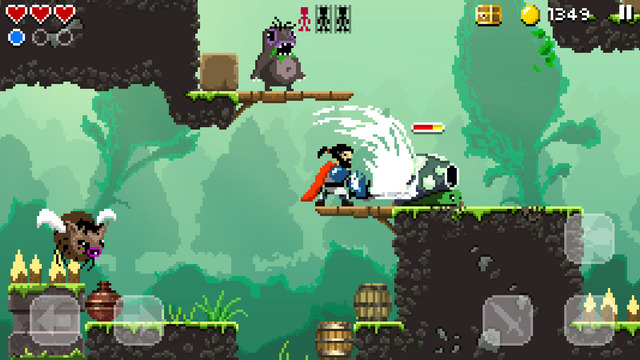 Sword of Xolan is an amazing platformer / role-playing hybrid that I’ve enjoyed thoroughly every time I played it. With some great features like challenge-mode (seriously, check it out! ), a very natural difficulty curve and enough collectables there is no doubt that you will enjoy this game. The only thing that I might have liked slightly less is that it was over kind of soon!